Local farm products including apples, maple syrup, and firewood. The Booty Family Farm is a two-generation family farm. We started clearing land in the 80's on the side of Mt. Israel and have been growing ever since. We are certified organic by the NH Dept. of Ag. We grow vegetables and small fruits and we make maple syrup. During the growing season, produce is picked throughout the day so that you can expect to find the freshest quality organic produce. You can find our produce seasonally at our farm stand at the farm as well as local farmers markets, restaurants and supermarkets. We offer bulk sales on some products for those wishing to can or freeze food. Feel free to contact Stephen Bartlett at 860-227-0397 or Diane Decker Booty at 603-284-7163. You can also find us on facebook. Please come visit us. 610 Mt. Israel Rd. Ctr Sandwich, NH. The Sandwich Farmers’ Market is open once a week: Wednesday, 4 to 6 PM, at the Federated Church on Church Street. In November, the Market is open once a month, the 4th Saturday, at the Benz Center, 9 to 12 noon. A special Christmas holiday market is held at the Grange. The Market offers locally grown vegetables, meat, fruit, eggs, herbs, jam, maple syrup and flowers. Several bakers bring breads, pies, cookies and scones. Fiber artisans demonstrate spinning and sell Sandwich-grown wool, angora and alpaca. Musicians, food, and socializing. Visit the Market on Facebook, Sandwich Farmers Market, NH. We hope to see you at the market. Email us at sandwichfarmersmkt@gmail.com. Wayside Farm is a small farm established in 1981. 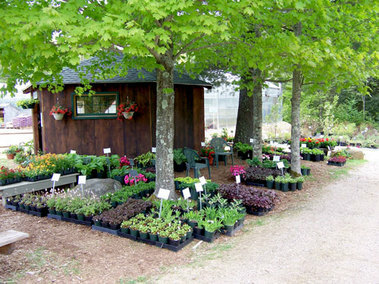 We provide northern New England gardeners with an excellent assortment of high quality flowering plants. We grow all of our plants right here in North Sandwich: seeding, propagating from unrooted cuttings from all over the world, and nurturing our annuals and perennials until they are ready for the garden. We pride ourselves on producing clean, high quality plants including a large selection of daylilies, hostas, and mountain laurels. Great Northern Berries was formed as an outgrowth of our work at Wayside Farm to establish a fruit orchard producing interesting, high quality, fully hardy berry plants for sale to northern gardeners at a fair price. Our plant offerings include the best assortment of Honeyberries (Lonicera caerulea) in the region. 506 Whiteface Road, N. Sandwich. Open daily May – Aug.
We offer our fresh picked fruit in a variety of options: fresh picked; fresh picked and frozen; jams; ice cream made exclusively for us by the Sandwich Creamery; and fruit wines by local vintners. The Dessert Table sells fresh baked pies every weekend made with our berries and assorted pastries are available fresh and frozen throughout the season.